Caravans and campervans have come a long way since their humble beginnings as a cheap and convenient way to take the whole family on holiday – modern day campervans range from a simple panel van with a mattress and gas stove, to a fully-loaded RV complete with 40-inch TV screens and a roof terrace. Caravans and campers really do offer something for everyone. And then there are those iconic on-screen campervans that have been used for much more than a simple family holiday – need an illegal mobile laboratory or crime-fighting unit? There’s a campervan for that too. Here are the world’s most pimped-out caravans, from the traditional to ultra-modern and everything in between. Gypsy travelling communities have become well-known for their flamboyant tastes, and their caravans, known as vardos, were traditionally horse-drawn wagons that reflected the owners love for ornate and colourful aesthetics – from both the outside and inside gypsy caravan life was an explosion of craft and colour. The Mystery Machine van from Scooby Doo is definitely one of the most iconic camper vans to ever hit the screen, but it’s not entirely clear exactly what type of van it was that ferried Fred, Daphne, Velma, Shaggy and Scooby from one ghost-plagued destination to the next. In the cartoon, some versions had a rear engine, which would point to a VW, while others were clearly based upon the Chevy G10, while in the live action film version, a Ford Ecoline was used. No matter what type of van it was though, that iconic sky blue, green and orange paintwork stands out and has would-be crime-fighters across the globing pimping out their rides to copy this look. The EleMMent Palazzo Superior was designed to be a ‘home away from home’ – and if your idea of home is the final word in luxury, then this is will be your very definition of ‘pimp my caravan’. The designers took inspiration from the worlds of motorsports, aviation and yachting to create a campervan so lavish and innovative, it’s still the world’s most luxurious caravan some five years after it was first unveiled. Its sleek white exterior, with curved racing lines and a panoramic and domed windscreen is straight from a sci-fi film and, amazingly, it stands at just 2.55 metres when being driven. But the real magic happens when it is extended to its full width of around 4 metres, and you witness the full splendour of the bar and fully-fitted kitchen in the main living area, alongside the beautiful master bedroom, complete with full king-sized luxury bed and 1.5 square metre rain shower. As if that wasn’t enough, the roof can be extended at the push of a button to reveal the sky lounge, which boats a complete 360° view from its spacious deck with integrated seating. 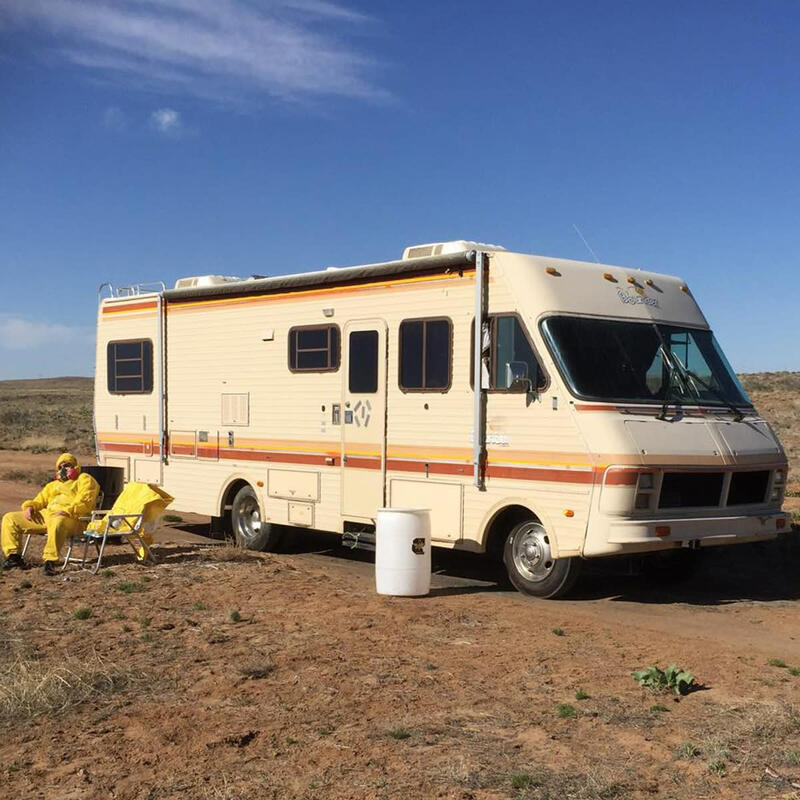 Arguably one of the most inventive uses of a motorhome came in the TV series Breaking Bad, when Walter White and Jesse Pinkman used a Fleetwood Bounder RV as a laboratory where they could cook methamphetamine to supply the local drug cartels. This mobile meth lab became known as “The Krystal Ship” and would be driven deep into the desert so the two could carry out their nefarious without being disturbed. The pair were never far from peril though, and the Breaking Bad RV scene, where the van runs out of power deep in the desert, is one of the most gripping and stressful scenes in the entire series. No van in the history of motoring has been customised as much as the VW camper van – from the Devon to the Westfalia, every type of Type 2 has had the full ‘pimp my caravan’ treatment. One of the most striking examples is the customisation carried out by Bristol-based Danbury Campervans – a £55,000, state-of-the-art conversion complete with flat-screen TVs and an ultra-high spec entertainment system. From the outside, this pimped-out Type 2 has all the hallmarks of boy racer cars UK-wide, with custom orange and black paintwork, Porsche alloys and lowered suspension. On the inside you’ll find two flat-screen TVs, a top-of-the-range entertainment system, electric sunroofs, swivelling chairs and even a hidden king-sized bed alongside the standard galley kitchen, oven and hob. Anyone looking to take down the criminal underworld single-handedly needs to have some hi-tech equipment and weaponry at their disposal, and Marvel’s The Punisher has arguably the most battle-ready camper van ever assembled. A heavily modified Ford V8 engine sits under the bonnet to ensure it can keep up with fleeing crooks, or make a quick getaway if necessary, the heavily armoured bodywork also features any number of mini machine guns, grenade launchers, fog and tear gas machines, and even parachutes, while inside sit a super-computer and crime-lab from where The Punisher operates with the help of Micro, his tech-guy. Whether you’re riding in a fully pimped-out campervan, or towing a top-of-the-line caravan, you’ll want to make sure it’s fully insured in case the worst ever happens and it’s somehow damaged or even stolen. To find quality caravan insurance that suits both your needs and your budget, give our insurance experts a call on 0800 0304 206 – our unrivalled choice of policies, is what makes 98.8% of Comfort Insurance’s customers say they’re happy with our service and would recommend us to a friend*.